The fund set up to rebuild the fire-ravaged Notre Dame Cathedral in Paris is set to reach €1bn (£870m) today as donations continue to pour in from billionaires, corporations and ordinary citizens. The French president Emmanuel Macron has set out an ambitious five-year deadline to get the difficult and costly restoration work done. French companies Total and L’Oreal have promised to each donate €100m (£87m) euros, while the billionaire families who own LVMH Group, Kering and L’Oreal pledged a combined total of €500m (£435m). The French government is gathering donations and setting up a special office to deal with offers of assistance. It comes as Pope Francis thanked rescuers who put their lives at risk to salvage the cathedral from a devastating blaze, and said he was eager to see it restored. “May the Virgin Mary bless and support the work of reconstruction. May it be a harmonious work of praise and glory to God,” he told tens of thousands of people in St. Peter’s Square on Wednesday. 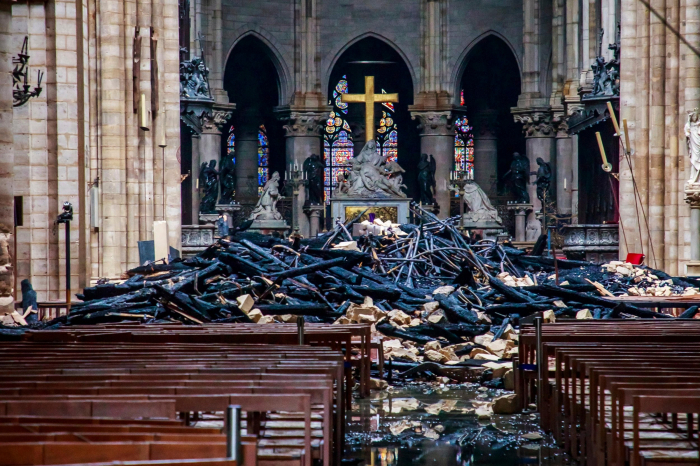 Mr Macron is holding a special Cabinet meeting on Wednesday dedicated to the disaster, which investigators believe was an accident possibly linked to renovation work. In a televised address to the nation on Tuesday night, the president said “we will rebuild Notre Dame cathedral even more beautiful”. Some criticism has already surfaced among those who say the money could be better spent elsewhere, on smaller struggling churches or workers. Meanwhile the president’s five-year deadline – which happens to coincide with the 2024 Paris Olympics, which the government wants to make a major showcase – struck some as unrealistic. “It’s a fundamental step, and very complex, because it’s difficult to send workers into a monument whose vaulted ceilings are swollen with water,” he told France-Info. Some 30 people have already been questioned in the investigation, which the Paris prosecutor warned would be “long and complex”. Firefighters are still examining damage and shoring up the structure after Monday's fire collapsed the cathedral’s spire and destroyed the roof. 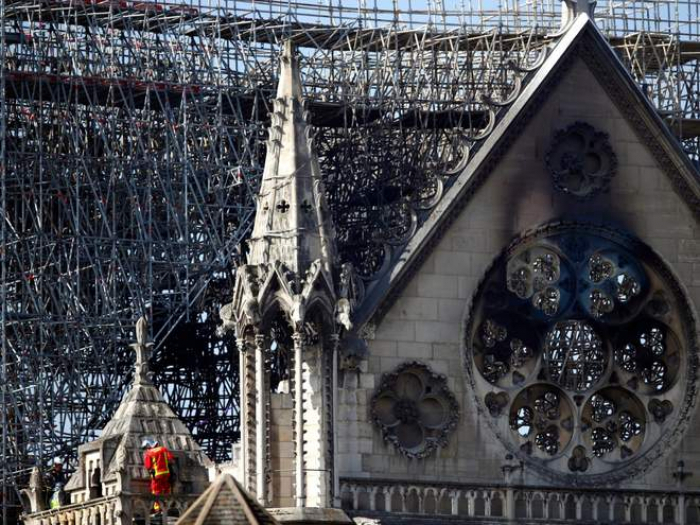 Among those questioned are workers at the five construction companies involved in work renovating the church spire and roof that had been under way when the fire broke out. The Crown of Thorns, regarded as Notre Dame’s most sacred relic, was among the treasures quickly transported after the fire broke out, authorities said. Brought to Paris by King Louis IX in the 13th century, it is purported to have been pressed onto Christ's head during the crucifixion. The cathedral’s famous 18th century organ that boasts more than 8,000 pipes also survived. Some of the paintings and other art works are being dehumidified, protected and eventually restored at the Louvre.